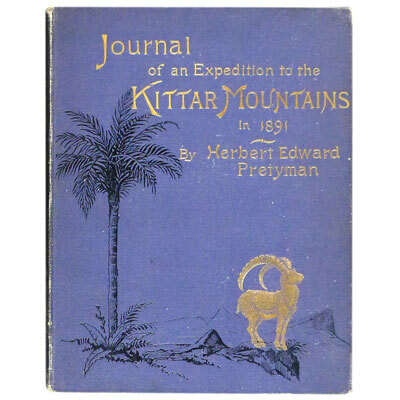 A near fine and extremely rare example of this journal which covers Pretyman’s 1891 hunting trip in the Kittar mountains, the Eastern Desert of Egypt, using the only known map of the area produced by Floyer four years earlier. Illustrated with a full page photo-lithographic plate of Herbert Pretyman, 34 other plates from photographs and a two page sketch map of the Kittar Mountains to the rear. Lieutenant H. E. Pretyman travelled back from Ismalia to London in 1891, he died the same year, whilst Camp Adjutant at Bisley, and it is believed he had not fully recovered from a severe attack of typhoid and jaundice in 1889. His father the Rev. Frederic Pretyman arranged to have the journal published a short while later. Provenance: With the bookplate of Henry William Mills.